Bethany and Xavier are even closer since battling Jake Thorn and his evil influence (in Halo) and Beth and her angel siblings must still protect Venus Cove from the Dark Forces. When a party game – a séance – inadvertently releases Jake from the Underworld, he disguises himself and tricks Beth into taking a ride on his motorcycle. When the highway opens up and swallows them, Beth learns too late that she’s now a prisoner in hell. What happens to angels there? As her archangel brother, Gabriel, her sister Ivy, Xavier, and her best friend, Molly search for her, Beth must weigh Jake’s bargaining for her freedom: one night with him, and she will be released back to Earth. Can Jake be trusted in this wager? And is he also using Beth to engineer the fall of the archangel Gabriel? Xavier has already lost one love – when Jake tricks him into thinking that Bethany is dead, his grief and anger result in a betrayal that will leave Bethany – and readers – wondering if he is so good after all. It will be up to Beth to use everything she’s learned about her powers as an angel – and about love – to free herself and those she loves from the clutches of Hades. Check out this awesome trailer for the series! 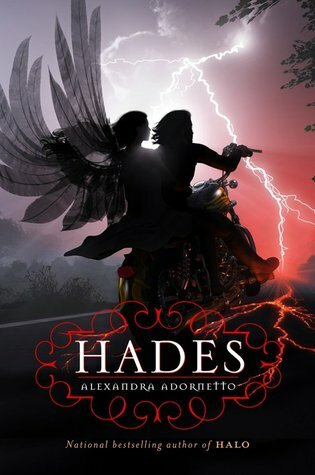 I have 1 copy of Hades from the publisher to giveaway! thank you!! can't wait for this sequel! i read halo and totally loved it! I haven't read it, and I'm hoping to get to it. I haven't read Halo yet but I plan to read it sometime soon. This series has such beautiful covers! I devoured Halo and I cannot wait to get my hands on Hades :) thanks so much for hosting this giveaway! That was a great trailer! Thank you for the giveaway! I've been dying to read this. Thanks for the giveaway! I really liked Halo. It was the first angel genre book that I read. I Really want to read Hades, it looks great. Halo seems great to read, I want it alot! I read Halo and fell in love with it. I'm dying to read more! This series looks so good! I own Halo but I haven't read it. But these books are gorgeous. I read Halo and I liked it, so I definitely want to read Hades.